A recent survey conducted by Birds SA discovered that Copley is home to several species of rare birds. The blue billed duck, elegant parrot, musk duck, Australasian darter and great crested grebe are just some of the species that were discovered by 12 experienced Birds SA birders at the Leigh Creek Coal Mine site. Thousands of birds of 68 different species were spotted during the two-day observation, with the greatest concentration of birds found at the Copley Retention Dam. Local naturalist Anne-Maree Taranto said the area has proven to be a flourishing habitat for several species. 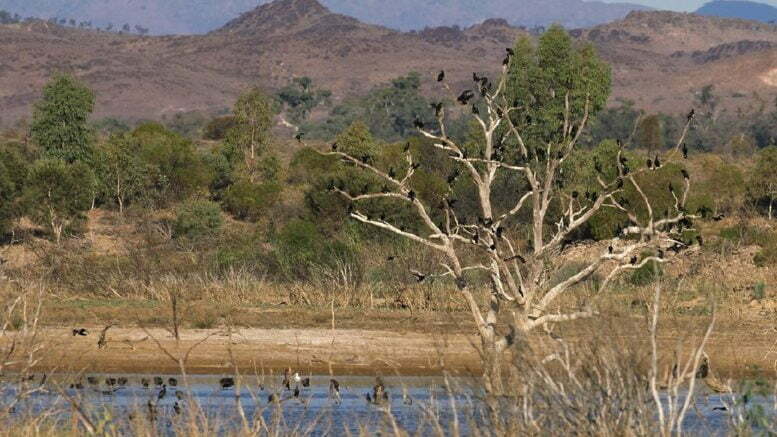 “The Copley Retention Dam has naturalised over the past 37 years into a unique, thriving habitat for land, shore and water birds alike, and is an important wetland for many endemic and migratory species,” she said. In an attempt to stop creek flow into the mining production area, Leigh Creek Coal Mine workers created the retaining dam in 1981. While operations at the coal mine were ceased in 2015, the dam has gone on to become a complex wetland habitat. Following concerns that the dam would be destroyed during the mine rehabilitation, members of the Adnyamathanha and Arabunna Elders and Traditional Landowners worked alongside various community groups to ensure it remain as a positive legacy of the mine. The proposal put forward in 2015 was approved by the Department of State Development. With food and water diminishing due to a lack of rain in the area, Ms Taranto highlighted the importance of the site for birds and other wildlife. “Rare and endangered species are known to exist in the area, and in times of drought, rarified water sources in outback South Australia become vitally important to the survival of wildlife,” she said. Many community groups, including the Anggumathanha Camp Law Mob Elders and William Light Foundation, have spoken out against the underground coal gasification (UCG) project that has been proposed for Leigh Creek. With a similar project in Queensland labelled as the state’s “worst environmental disaster”, locals fear that the Copley Retention Dam could suffer from potential contamination if a UCG mine is constructed just a few kilometres away. Conservation Council SA recently called on the Marshall state government to reject the energy project. Chief Executive Craig Wilkins said it was time to end the “irresponsible plan”. “It is totally untenable that technology banned in Queensland for causing what the state government there at the time called the ‘biggest pollution event’ in its history is being allowed here in South Australia,” he said. “Not only is this destructive technology, but there is absolutely no social licence from the South Australian community. “Traditional Owners have comprehensively rejected it, and it is deeply concerning that their views have been ignored. Bird lovers, Flinders Ranges lovers, lovers of community and fundamental human rights, please gift your support fiscally and otherwise and spread the word that we vote for the Pelican and rare species of birds and mammals that call the Flinders Ranges home. Please visit and support our campaign, its a great and safe investment in a sane and rogue corporation free future.